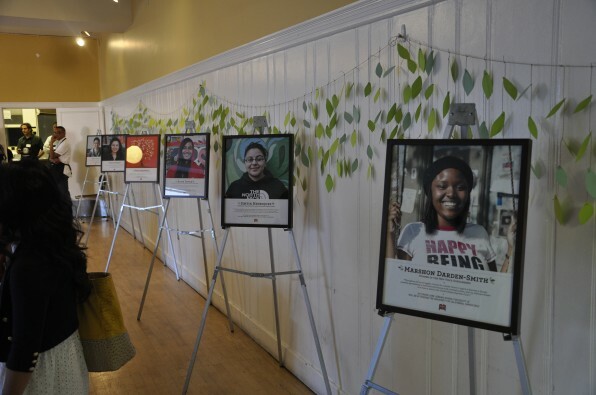 On August 7, the 826 Valencia community honored the past stories and promising futures of six college-bound scholars at our 2012 Scholarship Dinner. The celebration, in the Audre Lorde room at the Women’s Builidng, was rich with the love and support of the scholars’ friends and families. Previous scholars and the 826 Valencia staff were proud to introduce this year’s winners: Maria Figueroa, for the 826 Valencia Scholarship; Sintia Henriquez, for the Irving Hochman Memorial Scholarship; Nery Martínez, for the Nathan Jillson Memorial Scholarship; Roger Davila, for the Taylor Renfrew Ingham Memorial Scholarship; Marshon Darden-Smith, for the New Voice Scholarship; and Jerry Cheung, for the Young Authors’ Scholarship. These six individuals were recognized for their perseverance as students and as young people, and we are so excited to be a part of their next chapter. Read more about the 2012 scholarship winners. The $15,000 scholarships 826 Valencia awards to six Bay Area seniors yearly are made possible with the help of the program’s supporters. We are deeply grateful to City Arts & Lectures, the Brin Wojcicki Foundation, and the family of Taylor Renfrew Ingham for funding the scholarship program. We also thank Books Inc. for providing and serving the delicious dinner, Miette for the delicate dessert, and our neighbors at the Women’s Building for opening their space to us. With the tears and smiles (and mostly tearful smiles) of an entire community, this year’s Scholarship Dinner was a send-off fit for the students it honored.